MONTREAL - When the Belgian cyclist Wouter Weylandt was killed in a crash during the Giro d'Italia in May, the commemoration began immediately. Each rider wore a black ribbon, and Weylandt's initials and race number, 108, were painted across the remaining finish lines and appeared at the bottom of the official results with the slogan Always With Us. A tribute to the Belgian rider Wouter Weylandt, who died in May. But four months later, as the world championships in Copenhagen and the cycling season wind down, the eulogies have faded. And after dismissing Weylandt's fatal crash as part of cycling, neither the International Cycling Union, the sport's governing body, nor the organizer of the Giro has conducted a formal investigation. The police inquiry focused on criminal liability and found none. Weylandt was the 10th professional cyclist to die in a crash during a road race since Fabio Casartelli, an Olympic gold medalist, was killed at the Tour de France in 1995. Most of the other deaths, with the exception of Andrei Kivilev's during the Paris-Nice season opener in 2003, came in less prominent races and attracted relatively little attention. The growing danger in professional cycling is not limited to fatalities. The sport does not keep accident statistics, but riders and cycling officials agree that the number and severity of race accidents have escalated significantly in recent years. "There are a lot more dangers than 20 years ago," said Pat McQuaid, the president of the cycling union, which is more commonly known by the initials of its name in French, U.C.I. "But you can't compare a death in a cycling accident and an N.F.L. player going into a tackle and not coming up. In the Weylandt case, it was an accident out of the blue." "When I started racing, they told me that crashes are part of the contract," said Marco Pinotti, a prominent Italian rider who broke his pelvis in another crash in this year's Giro and was hospitalized for several weeks. "This is a dangerous sport, and it will always be a dangerous sport. But I think in the last few years, it looks like crashes have increased and become more severe because the speed is higher, the technology of the bikes has changed, and the level and size of the peloton is higher, much higher." Pinotti, who became a professional 12 years ago, is now recovered and made his comeback this month in Quebec and in Montreal, the only North American races that are part of the U.C.I. World Tour, which also includes the Tour and the Giro. 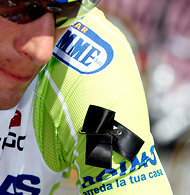 Craig Lewis, Pinotti's teammate and another Giro crash victim, has been less fortunate. Speaking from his home in South Carolina, Lewis said that he had regained only 75 percent to 80 percent of his usual form and that he probably faces additional surgery on a leg he broke in the crash. He did, however, finish the U.S.A. Pro Cycling Challenge last month in Colorado. Pinotti and Lewis were brought down by a common problem. In a bid to slow auto traffic, towns, cities and villages throughout Europe have narrowed roads near their entrances, added speed bumps and introduced islands and traffic circles. In the Giro, Pinotti and Lewis came around a corner on a descent and struck a small metal pole on an island in the middle of the road. But Mauro Vegni, then the race director for the Giro organizer, RCS Sport, issued a statement saying, "Where Weylandt lost control of the bike and fell, there were no obstacles, there were no vehicles stationary or moving, and the road surface had no defects or irregularities." Vegni added that riders' statements to the police indicated that as Weylandt looked backward on a downhill, his pedal hit a wall beside the road, apparently causing his spill. Expanding race fields have compounded any problems on the courses. Until the 1980s, about 130 riders, and sometimes as few as 100, raced in major events like the Tour de France. Today, 200 is more the norm. In a group that large, Lewis said, most of the riders in the pack are effectively blind to road hazards and must rely on shouted warnings from those at the front. "It's way too big," he said. "It doesn't make any sense." And the fields are made up of higher-caliber racers who have increased race speeds. Better training, stricter entry rules and generally higher salaries mean that little separates the fastest and slowest riders today. More often than not, it takes a major mountain or other significant obstacle to break up the pack of 200. The U.C.I. has been in a prolonged battle with teams over the use of radios to relay information to riders. Team managers and some riders contend that the radios can be used to warn riders about dangers. But McQuaid and others say that they create a form of distracted riding that leads to crashes and that team directors use them to order riders to take unnecessary risks. After crashing with steel-frame bikes 20 years ago, uninjured riders could often straighten their handlebars and ride off. But bike frames today are made of extremely light carbon-fiber composites that frequently shatter in even minor spills. Although the U.C.I. requires that bikes used by professionals weigh at least 14.9 pounds, that has not led to more robust equipment. Most teams resort to inserting lead weights or chains in the frame to reach the minimum. McQuaid said the cycling union was examining video supplied by the Tour de France to see if fragile bikes were adding to injuries. The rising danger in cycling has been the subject of little debate and even less study. No one from the sport has asked Pinotti and Lewis about their crash and neither expects any inquiry. Technology offers few obvious answers. Helmets became mandatory for professionals after Kivilev's death eight years ago. But helmets offer limited benefits in high-speed crashes, and the physical demands of cycling make it impractical to use heavier protective gear of the sort that has made motor racing significantly safer. Although no one is advocating an end to the town-to-town formula that gives the Tour de France its majestic beauty, the organizer of World Tour races here and in Quebec was able to minimize or correct road-related dangers by taking the riders on multiple laps over tough circuits, each about seven and a half miles long. Pinotti suggested that organizers of conventional races avoid drastic climbs or scenic wonders along narrow back roads. "You can make a race hard, you can make a race epic, just on normal roads," he said. McQuaid acknowledged the problems but rejected the idea that races had become crowded or followed needlessly dangerous routes. "At the end of the day, the responsibility is with the riders themselves," he said. "I don't think we can change fundamentally the whole organization of the sport." He added that if riders were ordered by their team managers to attack on a tricky descent, for example, "quite simply, they shouldn't do what they're told." But, as Pinotti said, what seems dangerous to one rider may be well within the skills of another. And in a sport in which two years counts as a long-term contract and employment is always uncertain, few riders are likely to challenge their bosses' orders. That uncertainty also lies behind the reluctance of most riders to speak up about the dangers in their sport. Privately, some say that airing their concerns is likely to make them less attractive to employers. And few teams rush to sign injured riders. HTC-Highroad, the American team that employed Pinotti and Lewis, is closing down at the end of this season after failing to find a new sponsor. Lewis is one of two riders on the team still without a contract for next year; Pinotti signed with another American team. "You're easily forgotten in the world of cycling," Lewis said. "It's a small sport. There's always old guys leaving, new guys coming in. I'm not going to be missed. It's not a loving sport."